Whenever Sonia and I see something that we've never heard of before in the aisles of Trader Joe's, we make a beeline for it. Inevitably, one of us will think it sounds delicious and the other will turn up their nose. In this case, I was the more interested party. Neither of us had ever heard of a food called a "bird's nest" before, but TJ's has done magical things with veggie-based dishes in the past, so I figured it was worth the gamble. I'm a fan of tempura-anything. I've had scrumptious vegetable tempura from a number of Japanese restaurants, not to mention some excellent meat and seafood tempura's as well. We've reviewed one other tempura dish from TJ's, which got a low-ish score, although this extraordinarily unique vegetable tempura concoction redeems Trader Joe's reputation with tempura completely, at least in my book. If you've had vegetable tempura before, you'll know that it's usually just one tempura-ized vegetable at a time. In this case it's several, including onions, which I've never seen in the form of tempura before. But I think it's the onions that really make this dish extra flavorful...just don't kiss anybody right after eating it. There are also carrots, kale, and of course, tempura batter. It's a delicious combination that winds up resembling the conglomeration of twigs, strings, and mud in a typical bird's nest. And if that comparison isn't very appetizing, just try the product, and you'll quickly forget about any negative images in your mind. To add to the taste-tacularity, the dipping sauce is simply brilliant. It's a simple soy sauce, but with just enough sweetness and savoriness to make it seem like a gourmet chef's original creation. It comes right in the package with the bird's nests, and there's plenty of it. One complaint: it's greasy. The nutrition info makes it seem relatively lean and low-calorie, but for crying out loud they claim that one piece is the recommended serving size! Sonia and I each ate 4 within minutes of pulling them out of the oven. If you're like us, you'll put away more than half your RDA for fat before you even have time to think. There's just something about these things that make them melt in your mouth and slide right down into your tummy. If we had bought two packages instead of just one, we would have immediately thrown the second one into the oven right after finishing the first. For the sake of my gut, I'm glad we didn't. But other than the fattiness, I can't recommend this product enough. It was a pleasant surprise for both of us. Just click here to watch Sonia and I tasting it for the very first time. I give it 4.5 stars. Sonia does too. Bottom line: 9 out of 10 stars. This sounds incredible! Maybe setting it on paper towels after heating would help with the greasiness, like you'd do with potato latkes? Love this blog. I love these. 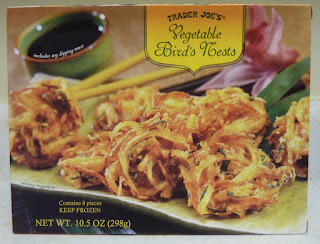 I think these are a much better version of Latkes than Trader Joe's actually offers! So good. On your recommendation, I tried these the other night and I agree completely with your review... they are fantastic! I polished off all 8 and wished there were more. Of course, as with most of this type of frozen item, they needed about double the baking time in order to become crispy. Yes, the sauce is good, and strong-flavored, so I was able to use sparingly. I still have one packet on reserve for a future dipping occasion! Considering most yummy asian-inspired TJ's items come barren of dipping sauce, I am very happy about this. I did try it some the tofu/edamame nuggets, and that was tasty. I think I might give these a 9.5! I'm somewhat disappointed in these. I was expecting an all over crispiness, but mine turned out soft, with just a bit of crisy on the edges. I thought baking them longer might help but they stayed mushy. Not that I was promised crunchy, I just assumed. Good sauce, though! Alas and alack, since I am now cooking from scratch again, these are no longer on the list of foods I purchase, unfortunately. So this is another item I couldn't find at TJ's today. Does stock vary by region? I read all the tags and did a visual inspection of the frozen aisle, because I really wanted to try these but no luck. Any helpful hints? I think these may be loosely based on the birds nest soup, which is indigenous to regions in Asia (apart from the soup). The birds nest soup is made from the nests of swallows that are harvested for that sole purpose. It doesn't look too appetizing. I'm glad these look tastier than swallows nests. I bought them the other day after seeing them on here. Can't wait to try them. 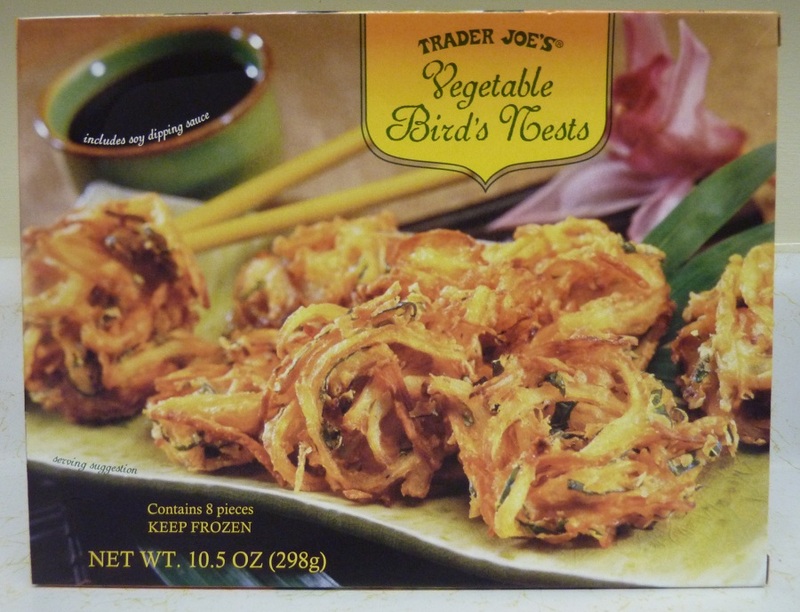 Back when TJ sold frozen veggies tempura, the box contained 1 or 2 of these birds nests things. I'm sad they don't sell the tempura anymore - the birds nests weren't my favorite part. These were delightfully delicious! They reminded me of stuff I used to buy in the restaurant but at a fraction of the price. Also very similar to something my mom used to cook. I fried them, not baked them since I wanted to keep the cooking more "traditional". I'm definitely going back for more. And these were not based on "birds nest soup" as one commenter assumed. These are a completely different flavor, texture, color, food-prep, everything. The ONLY reason these were called "bird's nest" is only because they resemble a birds nest. Nothing more, nothing less. Best prep is frying. It's tempura. I'd love to try these, I haven't found them at my TJ's though! Oh, but if you like crab rangoon, OMG theirs is yummy-licious! the reason it's called bird's nest is because there is a dish called bird's nest, which consists of a fried outer bowl filled with seafood inside. just type in "bird's nest seafood". these are bite-sized versions of those. Ooh! I want seafood in my bird's nests! I really like them, but I only have one or two, toss the sauce out (750 mg sodium per serving), and seer them over an open flame before cooking. State Fair fare. Ingredients: Soybean oil, potato starch, tempura, soybean oil, potatoe, less than 2% of the following: onions, carrots, kale. Thanks FDA. They crisp up really well in a toaster oven! I bought them yesterday after I noticed it in TJ. They are similar to Indian dish called 'pakoda' or 'pakora' which are made with onions and other veggies. Dipped in batter, fried and crispier in texture. Do they still have this? Or was it discontinued?